As I was scrolling through my nearest cinema listings this morning, I noticed a special preview of this film on this evening. Not particularly hopeful that there would be tickets left, I thought I would chance it and try and book. To my surprise there were tickets available, so, after work I toddled off to see this. This was being screened live from the Imperial War museum, and had a display of a private collection held there of the postcards and pictures from this particularly advantageous crusade of two people in Berlin between 1940 and 1943. 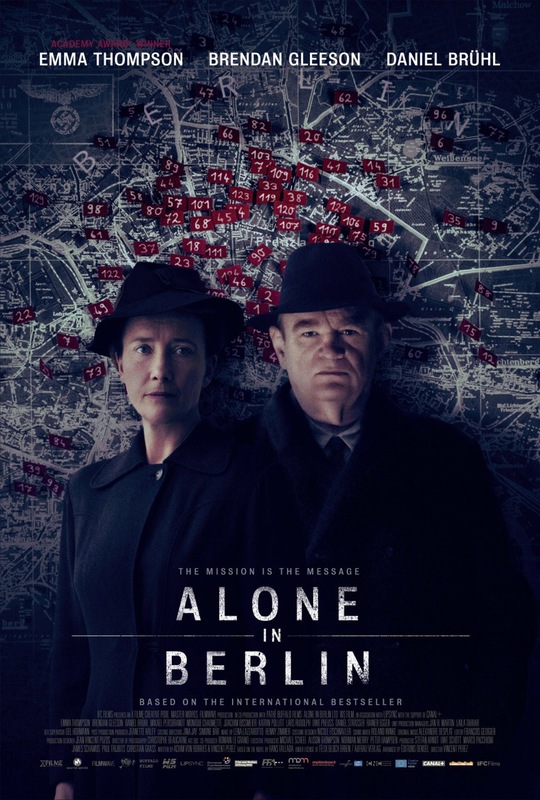 I was lucky enough to have read “Alone in Berlin” as part of my course and Univerisity, therefore had some background knowledge on the book (previously named “Every man dies alone”). If you haven’t read it, or heard of this tale, it is well worth investing the time in. I won’t go in to masses of details about this film, as this isn’t released until then 30th of this month out for general viewing, but I will give you a brief overview. Otto and Anna are a general German couple, their only son has been killed as part of the war effort. They are in a stale marriage and the news takes both of them differently. Anna is emotional and lacks the support of Otto. Otto appears to just carry on, not letting his emotions out at first, but as the day wears on an anger builds in him. Here he starts a crusade throughout Berlin with his wife, leaving postcards scribed by him, telling the truth about the Hitler regime. Soon the local police, Gestapo and the SS are hunting the treat. The performances in this film are excellent. Brendan Gleeson as Otto, plays a stoic character, measured in his actions and totally Germanic. Emma Thompson as Anna is an excellent choice, her soft determination shining through in the role, making her the perfect counterpart to Gleeson. Some of the filming in this is beautiful, utilising the views of Berlin and matching the bright red of the Nazi flag against drab buildings to make the Nazi presence dominating in the film. If you are looking for an all action movie, this isn’t it, this is very much low key and hushed tones, giving the whole film the feel of being something secret…a silent threat from two people against the whole of the Nazi empire. There is also no happy ending, this has not been Hollywoodised to mollycoddle the audience. What I really love about this is the buillding relationship of Otto and Anna, as they redefine their purpose in life, and get to know each other again. The on screen relationship is touching, and in my opinion is a real triumph for writer and actors in portraying how love changes and morphs dependant on time and circumstance. This has been rated a 12A, but I am not sure that I would take a child of 12 to see this. There is some violence, but one particular scene towards the end is a little traumatising for the younger viewers. The book was based on actual Gestapo files which were given to Hans Fallada just after the war, and this film has done a tremendous job of portraying the propaganda war that they waged around Berlin. If you are interested in watching this film you can watch the trailer here. Believe me, while not all gun shots and men running through burning cities, this is worth watching.